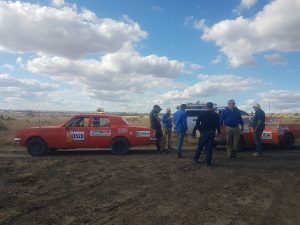 What do you get when you have 85 cars, all at least 40 years old, 28 support vehicles, a lot of dust, the open road, and 270 old and new friends? In this case, you get another successful Royal Flying Doctors Service Outback Car Trek! Opteon Shepparton Valuer David Elford is an active supporter of the Royal Flying Doctor Service (RFDS), through his involvement with the Outback Car Trek. This June, as part of Team 1520, David signed up again to trek from Tamworth to Airlie Beach. Since kicking off in 1989, now in its 29th year, the Trek has raised in excess of $28 million. 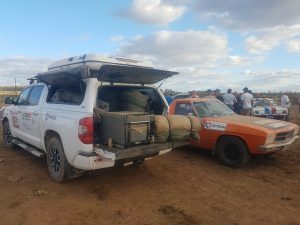 Over the years the Trek has travelled the length and breadth of Australia and has raised funds for the RFDS and for many of the small regional communities it visits along the way. It’s provided donations to local schools; Parents and Citizen’s Associations; the School of the Air; sporting groups; community organisations and cultural groups amongst many other great causes. The Trek is the RFDS major annual fundraiser, bringing in an average of $1M each year, with this years’ raising in excess of $1.35m. 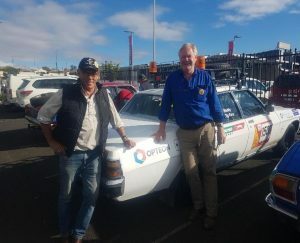 “This year I was invited to join good friend and Opteon Albany client Grant Hodgetts in an early model Holden Statesman. 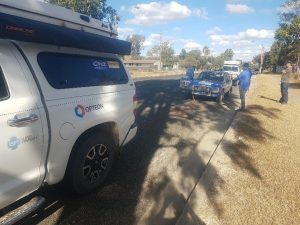 We drove from Tamworth to Airlie Beach – around 3,500 kilometres – with overnight stops at Inverell, Meandarra, Taroom, Emerald, Alpha, and Mount Coolon. Of the 3,500+ kilometres not many were on bitumen,” David said. “Each day the trek organisers had arranged morning teas and lunches at either small primary schools or at station homesteads that were involved with School of the Air. All of these people had stories of the Flying Doctor who had either assisted their family or station hands which really brought home the need and reliance of the RFDS for these remote communities. 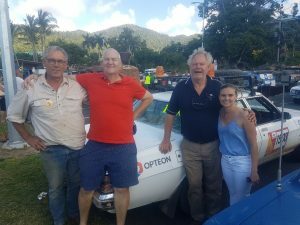 “At the finish line, it was great to catch up with Tim Adams and Courtney Cranmer of the Opteon Airlie Beach office who came down to greet us and have a look at the assortment of vehicles. David Elford and Grant Hodgetts at the start line in Tamworth. An unhappy Peugeot at Goondiwindi. Wayside stop out of Taroom. Wayside stop out of Mt Coolon. David Elford, Tim Adams Grant Hodgetts and Courtney Cranmer at Airlie Beach.